On this beautiful late August afternoon, during the lull between tour groups at Nathan Hale Homestead in Coventry, CT, I took a stroll around the museum grounds and noticed quite a few early signs of autumn, which is still three weeks away. Out came my iPhone and I photographed my favorites. Fall is a very evocative season in these parts, actually my favorite, for its warm, dry days and chilly evenings, not to mention the riot of color that surrounds us out here in the country. But that’s still in the future, and today I took much pleasure in the experiencing the last third of our current summer. Goldenrod begins to bloom in late July to reach its peak around now, bright and full for a few more days before it begins to turn brown. 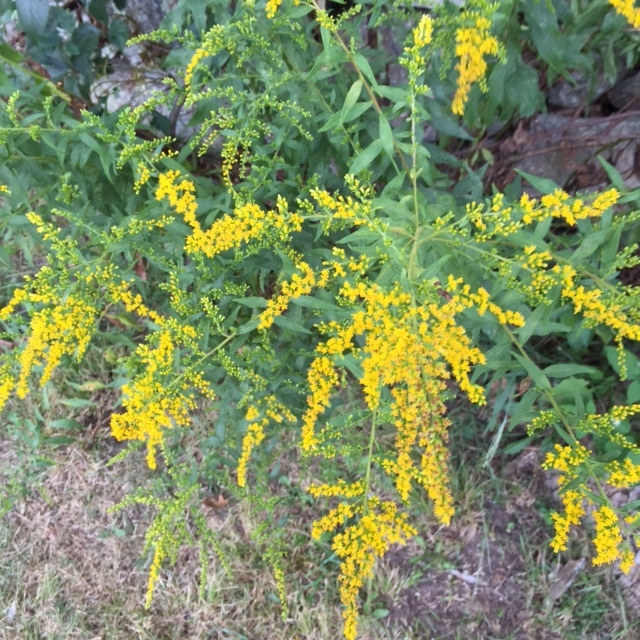 Contrary to popular opinion, goldenrod is not a plant that causes allergies. 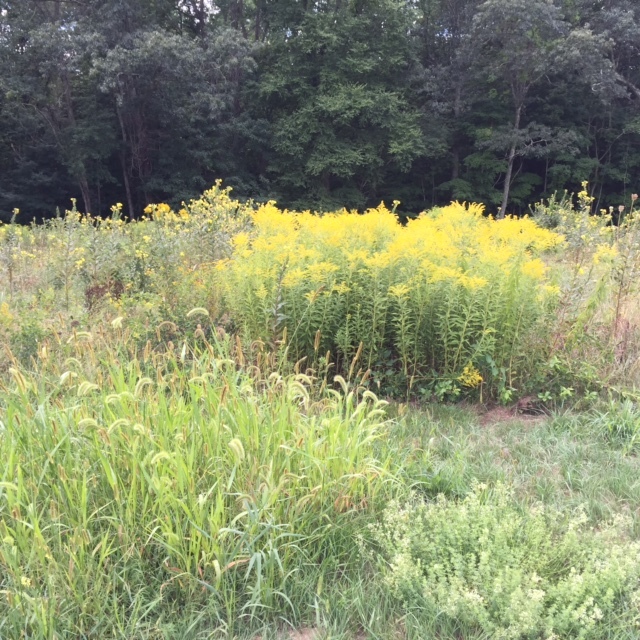 Up with goldenrod, down with ragweed! 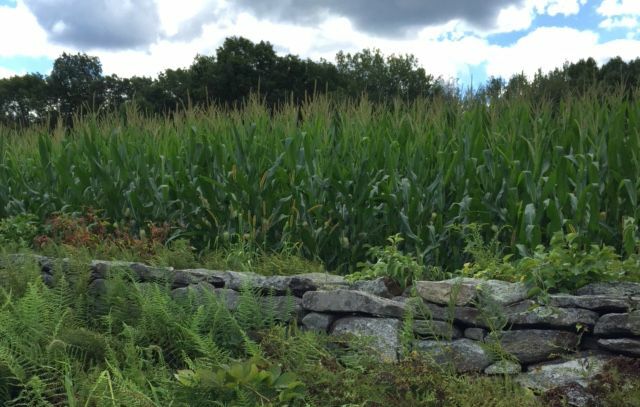 The corn is a high as an elephant’s eye…. Hops! Just about ready for picking, but not enough, alas, to make beer. Pokeweed, with its prolific crop of berries about to turn purple. I like to use this with school groups, to make ink for our spy class documents. Our junior docents are already hard at work preparing for our haunted corn maze, which takes place on late September, early October weekend evenings. Especially fun when there’s no moon, which makes the maze even darker and spookier. First the props, then the costumes. It’s their favorite event of the year, and possibly our most popular. A list of some of my favorite books for getting into the mood of the holiday. In 1889, Eleanor Bly flung herself from the tower of Five Mile House after murdering her seven children. More than a hundred years later, her ghost reaches out to Leslie Stone, a New York cop who has killed a child murderer and is haunted by her actions. Or anything by Rickman, for that matter. Smile is an eloquently written ghost story wrapped in a mystery, and the suspense never flags. Also see The Cure of Souls. Vampires are not just the stuff of legends and fantastic literature. In the 19th century, an outbreak of belief spread throughout New England and resulted in many bizarre incidents aimed at preventing vampires from preying on their relatives. 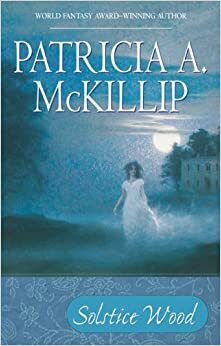 This little book is a well-researched account of the 19th century beliefs that connected consumption (tuberculosis) with vampirism in the minds of many New England residents. Check it out if you’d like to discover what was done to prevent the dead from stealing away the living. And yes, it did involve stakes and hearts and burning. If reading this account doesn’t put you in the mood for creepiness and hauntings, nothing will. New England folklorist Michael Bell spent some time in Eastern Connecticut and Rhode Island, interviewing people who still have direct connections to a little known outbreak of vampire beliefs a little more than 100 years ago. Food for the Dead, admirably researched, presents a series of case studies involving the (still-common) belief that the dead can be jealous of the living and return to spirit them away. Sylvia Lynn comes from a family that has lived in Lynn Hall for generations. Several years back, she left home rather abruptly, moving across the country, but now she must return for the funeral of her beloved grandfather. Sylvia is stunned to learn that Lynn Hall is now hers, according to her grandfather’s will. She plans to stay only a few days, and on her last evening, attends the Fiber Guild, a women’s club that has met at Lynn Hall for a century. It becomes more and more clear that something peculiar is going on, for the guild members seem unusually intent upon their designs and stitches. Heart Shaped Box is a modern ghost story full of almost believable supernatural threats. Following Jude and Mary Beth as they scour first their intellects, then their instincts, and finally their very souls, trying desperately to evade the deaths that seem inevitable. A classic, and still one of the most chilling, and psychological, ghost stories ever told. Another great classic. House of Seven Gables is an eerie ghost story based upon actual historical events. Hawthorne knew Salem and its history inside and out, and he also knew how to create a haunting atmosphere and a story that stays in the mind forever. One one of those novels that is more atmosphere than adventure. If you allow it to proceed at its own pace, it will weave its web around your mind. Subtle but effective, it’s sense of threat and menace grows a bit with every chapter. I’ll tell you, I sure wouldn’t set foot in that woods. These should keep you busy – and nervous – until the witching night is over! If a dead person’s eyes are left open, he’ll find someone to take with him. If you touch a loved one who has died, you won’t have dreams about them. 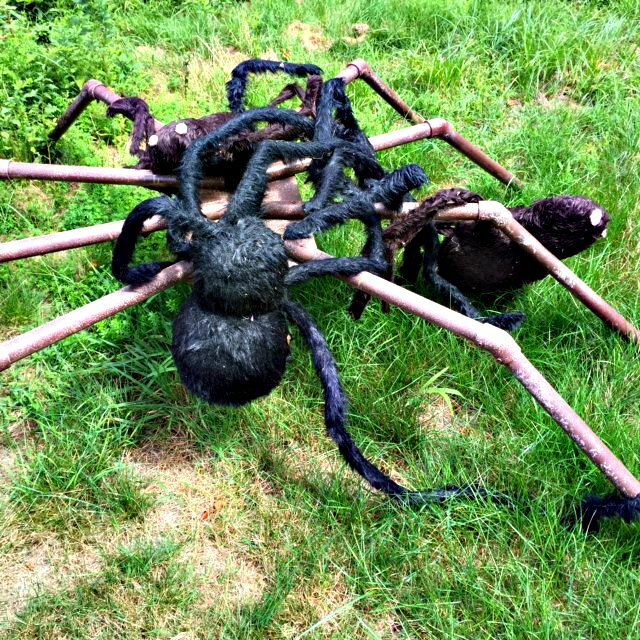 If you see a spider on Halloween, it could be the spirit of a dead loved one watching you. An ancient myth our ancestors believed was that the image in a mirror is our actual soul. A broken mirror represented the soul being astray from your body. To break the spell of misfortune, you must wait seven hours (one for each year of bad luck) before picking up the broken pieces, and bury them outside in the moonlight. The use of tombstones may go back to the belief that ghosts could be weighed down. Mazes found at the entrance to many ancient tombs are thought to have been constructed to keep the deceased from returning to the world as a spirit, since it was believed that ghosts could only travel in a straight line. Some people believed that the soul remained with the body 24 hours after death. Members of the family, or friends of the deceased, often chose to “sit up” with the body. This kept the soul company and prevented it from being whisked away by the devil. History News: Witch’s Grave Unearthed in Italy? Just in time for Halloween, archaeologists working in Piombino have discovered the skeleton of a woman, surrounded by 13 nails, and with 7 others driven into her jaw. The body was buried without coffin or shroud. Theoretically, the jaw nails may have been intended to prevent her from rising from the dead, with the 13 nails piercing her clothing, to attach her body more firmly to the ground, Two years ago, a skull was found in Venice, with a stone forced into the mouth, a way to keep vampires in their graves. Another skeleton was surrounded by 17 dice, the number 17 being associated with death in Italy. Belief in witches and vampires seems to have been world wide, and here in New England, especially in the 19th century. When an individual died of consumption (tuberculosis), it was common for other members of the family to begin showing symptoms, “wasting away”, and often waking after coughing spells with blood around the mouth. In the days before germ theory was commonly accepted, people suspected that the deceased had returned from the grave to feed upon the living. The remedy was was a gruesome one. The skeleton of the deceased had to be exhumed, the heart removed and burned to ashes. Often the sick relative would be fed a “tea” containing some of the ashes, in hopes of effecting a cure. Sometimes, the head and long leg bones would be placed in a “skull and crossbones” arrangement, to keep the deceased from rising yet again. Historians and folklorists think that practices such as those described here may have been more prevalent than we know, mainly because the evidence must be obtained via the examination of long buried bones. It’s Halloween Again: What is an angel but a ghost in drag? Stan Rice asked the title question, and got me wondering about that myself. We’ve all told scary stories around the old camp fire, dressed as ghosts at Halloween, and laughed at “Ghost Busters”. 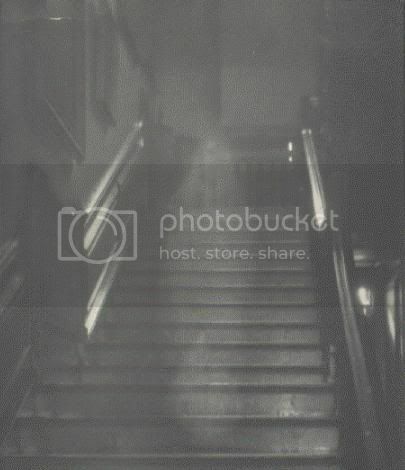 Many of us believe we have had ghostly encounters of various kinds, close or otherwise. But what exactly IS a ghost? What’s the thinking about that age old question now, in the new millenium? Well, the quick answer is, nobody know for sure. But reports of hauntings, apparitions, ghosts, and other “supernatural” experiences occur so commonly that many theories have been developed, and these occurrences have even been categorized. Many religions tell us that we are all spirits, or souls, residing within a physical body. Perhaps the most prevalent theory today is the view that ghosts are the spirits of the dead that, because of some trauma, such as murder or significant loss, are trapped between the earthly plane of existence and the other, the place where souls are thought to go after departing the body. Many paranormalists think that ghosts don’t realize they are dead and simply hang around locations where they died in an untimely fashion, or where they were happiest during life. Psychics and ghost hunters say that these spirits need to understand that there is another place for them now, and when they achieve that realization, they will find “release” from earth. “O death, rock me asleep, bring me to quiet rest, let pass my weary guiltless ghost out of my careful breast.” Poor Anne. In future posts, I’ll be writing about other ghost theories and maybe even telling some true stories and events. When our son was a student at Keene State College in southern New Hampshire, we learned about a very special Halloween event, the Keene Pumpkin Festival, held every October on the town’s quintessentially New England Main Street. Everyone is invited to carve and enter a jack-o-lantern, and all the entries are set up , on tiered shelves along both sides of the street and in other, very creative ways. This is an all day event, with music, costumes, food, fireworks, crafts, and competition. In 2003, the festival broke the Guinness World Record for the number of lit pumpkins in one place, with nearly 29,000. Last year, more than 80,000 people packing the sidewalks, a new attendance record. Bring a carved pumpkin and a 3-inch votive candle to Railroad Square in downtown Keene the day before the event between 8 a.m. and 6 p.m. and log it in at the Log-in Tent…or bring your creation the day of the festival and log it in at one of the seven Official Log-in Tents located at every intersection on Main Street. To be counted for the official record, all jack-o-lanterns must be carved and entered at an official Log-In Station before 6 p.m. the day of the festival. Once you log in, pick a place along Main Street to show off your creation!